I'm trying to delete a Record Type. I've removed the record type from all of the profiles that I could. But now when I try and delete the Record Type it says I have three profiles still using it. Chatter Free User, Chatter Moderator User, and the Force.com Profile. Looking at these profiles there's nothing showing where I can remove any Record Types? At this Point you will be at the Edit Record Type Settings Page for the Object. 5)You are now going to replace the id in the Edit Record Type Settings Opportunity Page ( the first id number right after the "jsp?id=" in the URL ) with the Id from the Chatter Free User. 6)Now take the modified Url and place it in the Address bar of your browser and hit enter. 7)You will now be able to remove the value by highlighting it and selecting remove. Switch the Default record type to whatever you like and hit save. All you need to do now is repeat this for any other Profiles in which it is necessary, then Deactivate and Delete the Record Type. I am facing the same problem. Did you get an answer to this? Bumping this because unfortunately neither of the links from the above comments are active any longer. Does anyone have an up-to-date answer for this question? Thanks for your help! Nice one Desiree. Here's an even simpler way to implement this cool little workaround, using the classic, rather than enhanced profile editor. 1. Go to users > profiles and open the system admin profile and the chatter profiles that you can't get at in different tabs in your browser. 2. In the system admin profile, click edit beside the record type you want to change in the chatter profile. 4. Switch back to the system admin tab in edit mode and paste in the ID of the chatter profile you want to edit in place of the system admin ID in the bit where the url says id=xxxxxxxxxxxxxxx then press [Enter]. 6. I'd recommend leaving the return url as it is (e.g. system admin). That way you can just save your changes, rinse and repeat. For some reason I'm running into the 'insufficient priviledges' error when using your method and Desiree's method. I'm have system admin permissions - is there something more I need? I confess I can't even remember why I had this problem and it's certainly way off my area of expertise! Disclaimers now out of the way, if you are a full system admin and you have insufficient priveleges, then there must be another reason. Possibly it's the edition of Salesforce - I was using Enterprise? If that's not the reaosn, then I'd suggest contacting Salesforce support. Sorry not to be of more help. Not a problem! I think contacting Salesforce support is a great idea! I was running into this problem as well and wanted to share my experience in case it could help someone else. I was trying to do the URL hack mentioned above today in Lightning, and was having a very difficult time. It was unable to figure out the user id in the url on the edi page as it does not match the id on the profile page. 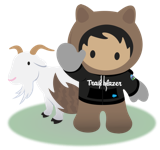 However, switching to back to Salesforce Classic (after wasting way too much time trying to do it in Lightning) I was easily able to match up the ID's and get the record type setting updated on all the Chatter profiles impacted. So from my perspective (as a non-developer) I would highly recommend doing the hack in Classic, not Lightning. Also, may be obvious to most, but just in case - after you add the ID into the URL you need to hit Enter. Only then will you be able to make the update. I was also getting insufficient privileges errors, and I ended up disabling the "Enable Enhanced Profile User Interface" setting in the User Interface settings. Then I was able to perform the URL hack described above. So, in summary, this hack doens't work if you have the Enhanced Profile User Interface enabled. But you can just temporarily disable it, perform the URL hack, and re-enable it. I tried Desiree's way but Enable Enhanced Profile User Interface was already disabled, so tried your way and it worked perfectly.....I love these little work arounds and will remember this one. Thanks Sean. Your method worked brilliantly. I left off the return URL. Everything else I'd tried today failed. Finally after too much time I can clean up this object. Desiree Leslie, OMG!!!! That was awesome! Thank you. I saw something similar to this but it looked complicated. You're easy to follow steps are a godsend! Will you be going to DF17? Beer is on me!!!! It worked for me. This is really an Awesome URL Hack !!! 6. I'd recommend leaving the return url (at the very end) as it is (e.g. system admin). That way you can just save your changes, rinse and repeat. NOTE: The "Enable Enhanced Profile User Interface" is no longer under User Interface in setup, instead it is in Setup > Manage Users > User Management Settings > Enhanced Profile User Interface. I also completed this in Classic and received no Insufficient Privileges errors. Buh-Boom! Awesome Sauce! Thank you!!!!!!! I havent tried every one of these solutions and nothing is working for me. I've tried in both classic and lightning. Maybe something changed in a recent update? Hi Sanerio, Leslie's workaround is still working for me. Just tried today. But i had to switch in classic first to make it easier to catch all needed ID. By the way, Thanks a lot Leslie for your clear description of every step. Simple and Straight Answer! Simplifying from the above Answers. Lightning : Records Types Cannot be removed through Lightning Interface. Therefore Switch to Classic. ALAS!!! We see the record Type Edit for Chatter's Page.